***UPDATE*** Check out a new post on firewall requirements here. Similar to the previous version of VSI for the C# vSphere Client, VSI for Web Client also leverages the SMI-S provider for provisioning storage. Unlike the C# version though, it also uses SMI-S for viewing details of storage. VSI Classic as I will call it, used direct Solutions Enabler connections to do this. Furthermore, there is no longer a concept (at this point) of different VSI features in separate downloads. 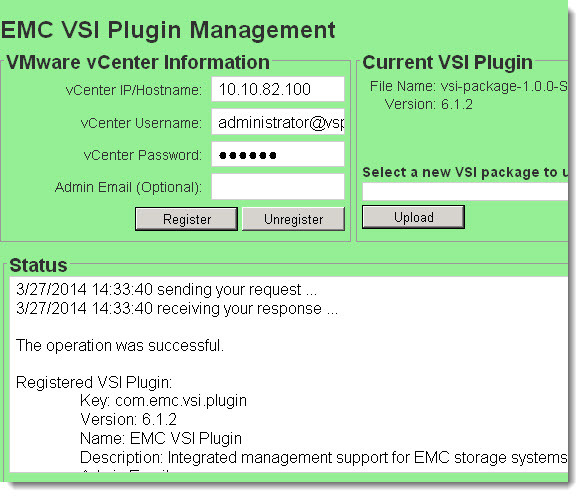 If you download VSI for Web Client you have the provisioning feature and the storage viewer feature. Also, VSI is no longer a client-side plugin that needs to be installed on every host that has the vSphere Client installed. 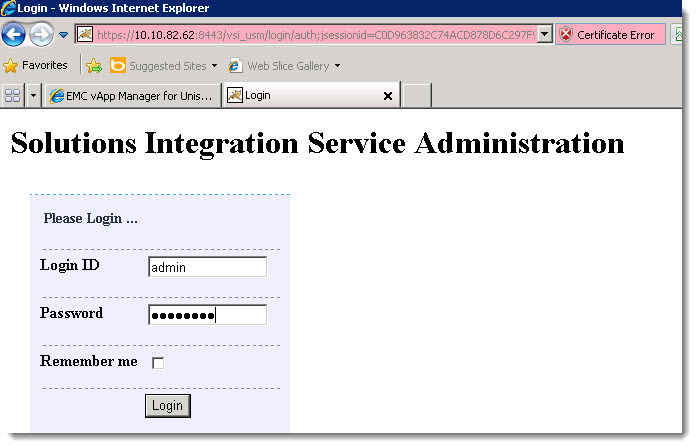 Since the Web Client is a server-side plugin, so is VSI. 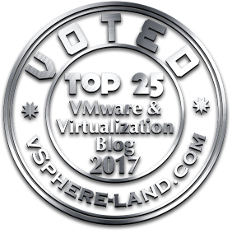 VSI is now a virtual appliance OVA that is to be deployed onto an ESXi server and then configured to be pointed to a vCenter server instance. The vApp does not have to be deployed on the same vCenter server that it will actually be used with. Once you deploy the vApp (pretty standard process–give it valid IP information) you will need to do some quick configuration. Point your browser at https://<IP of vAPP>:8443/vsi_usm/admin and log in with the default credentials of admin/ChangeMe. For the purposes of this post I will register a vCenter. Enter in the vCenter connection information and click “Register” should complete in a matter of seconds. Note that this is the vCenter not where the Web Client is–they are usually the same IP but if they are different use the vCenter information. Once complete you can login to the vSphere Web Client and under the vCenter you registered with you will see a new line item near the bottom called EMC VSI. 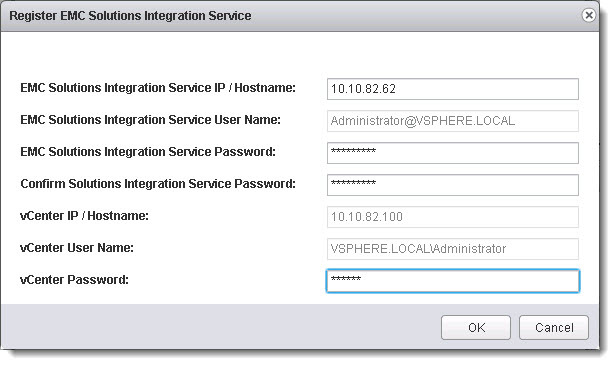 Before you can provision storage or see storage details you need to register the Storage Integration Service running in the VSI vApp from within the vCenter. Click on either Storage Systems or Solutions Integration Service and you will be able to add in your vApp here. You need to do this in order to enable provisioning or storage detail viewing in the Web Client. Once registered you can register an array. I will register a VMAX since I do not have a VNX handy. Now you can add a new datastore. 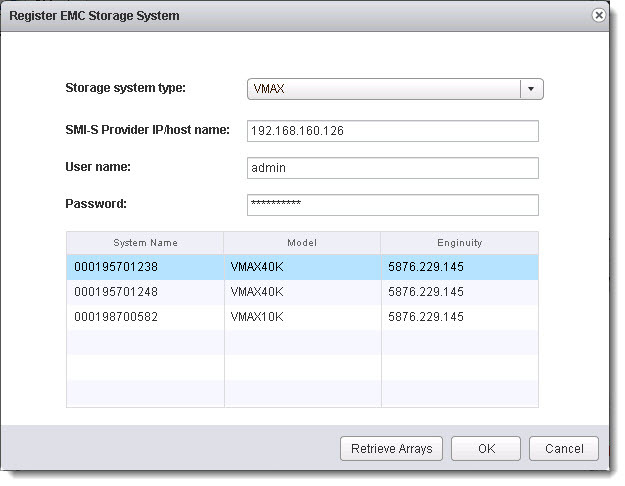 Select a host or a cluster or VM and right-click. The VSI option will appear in the menu (some times it takes a few seconds after the initial menu loads to appear at the bottom). Choose New EMC Datastore and move through the menu. You can choose the array, the thin pool, the size of the device, the masking view and whether it is a striped or concatenated metavolume (use striped whenever possible). VSI attempts to make the member count as small as possible by using the largest members it can. So a 300 GB volume is going to be two 150 GB members. Since the maximum member size is 240 GB it will be two members until the members hit that limit. Pretty straight forward. I created a 300 GB datastore named VMAX_DS001. Once created, you can navigate to the datastore and you will see two new boxes under the datastore summary that are populated by VSI. Storage system and storage device. They show the underlying details you might need to know. There is also a tab at the VM level for virtual disks and RDMs that show this information. 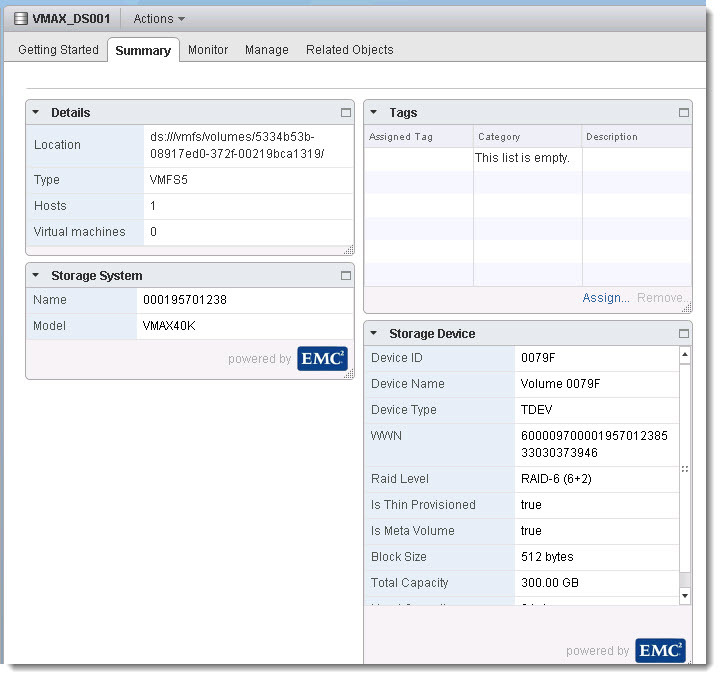 A sub-tab under monitor that is called EMC Storage Viewer. For some more information check out Drew Tonnesen’s blog on VSI Web Client. Stay tuned for more posts on the subject as I delve further into VSI 6.1 for the vSphere Web Client!